Leaf senescence is a genetically controlled process which can cause nutrients to transport through the newly developed young parts from old organs. Senescence process is effected by developmental and environmental signals and ultimately it is reprogrammed metabolically. It has been known that senescence process was effected by plant hormones. The senescence includes changes of their photosynthetic apparatus. Yellowing of cotyledones and leaves is clear that chlorophyll breakdown has served as the primary parameter for the measurement of senescence. It has been known that ethylene, ABA and brassinosteroids promote senescence but auxins, cytokinins and gibberellins are retardants of senescence. However, the correlation between hormones is very effective in the senescence process. The part of investigations on senescence has been included external application of a substance before the onset of senescence are in plants. The findings of these applications are still being discussed. 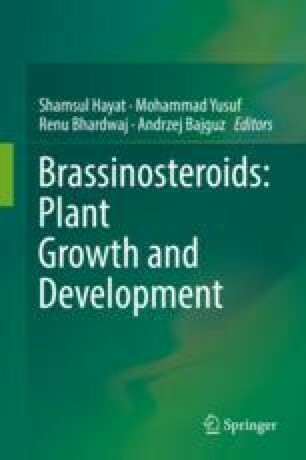 In this chapter, the effect of brassinosteroids on senescence is discussed. I am grateful to Istanbul University’s Scientific Research Project Unit (BAP), which supports my projects when I approach the mysterious world of brassinosteroids during my senescence studies. My studies on this subject is supported by BAP, Istanbul University’s Scientific Research Project Unit, with the projects. I would like to thank Shamsul Hayat for offering to contribute to the creation of this book. Also, I apologize in advance of all the scientists working on brassinosteroids and senescence that I have inadvertently made mistakes during writing the chapter. I would also like to thank Serhat Başkan for helping with the English text. McGoodwin, M. (2008). The physiology of higher plants an outline (p. 108). http://www.uwyo.edu/botany4400/ using the same textbook to present a quite different plant physiology course outline.